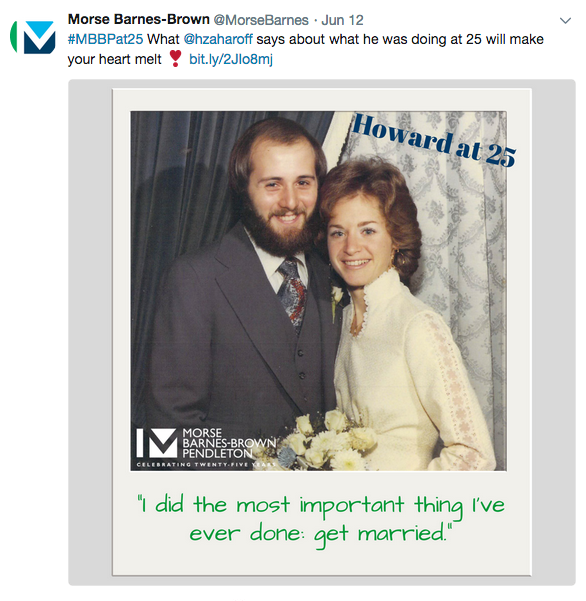 Long time client Morse Barnes-Brown Pendleton is celebrating its 25th anniversary as a law firm with a fun social media campaign on Twitter. I have nothing to do with the effort — it is the brainchild of the firm’s Director of Marketing Jaclyn Braga. 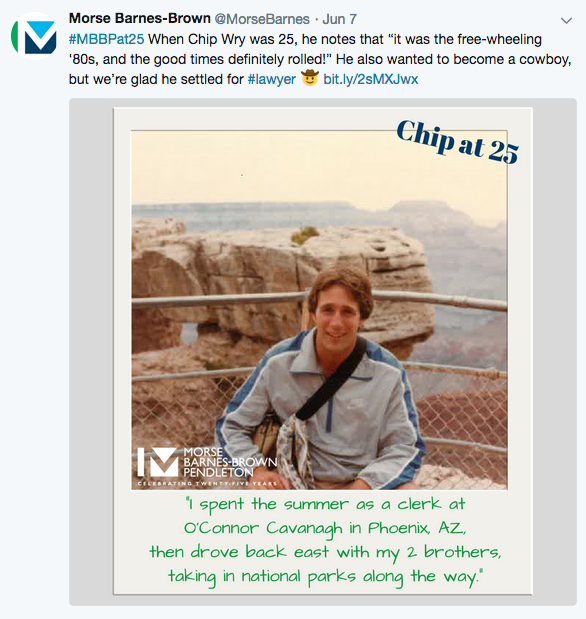 The campaign celebrates the “Age of 25” through a series of Twitter posts that give us a brief glimpse into the life of each attorney/professional at the age of 25. Each one is a reminder of how our lives were full of daring and possibility at that stage of life (and, by association then, so too must be the law firm). Morse Barnes-Brown Pendleton was founded by pioneering downtown Boston lawyers who picked up stakes and moved out to Waltham to move closer to clients in the burgeoning high-tech corridor along Route 128. Now with additional offices in Cambridge and Boston, the firm continues to seek ways to get closer to budding businesses. 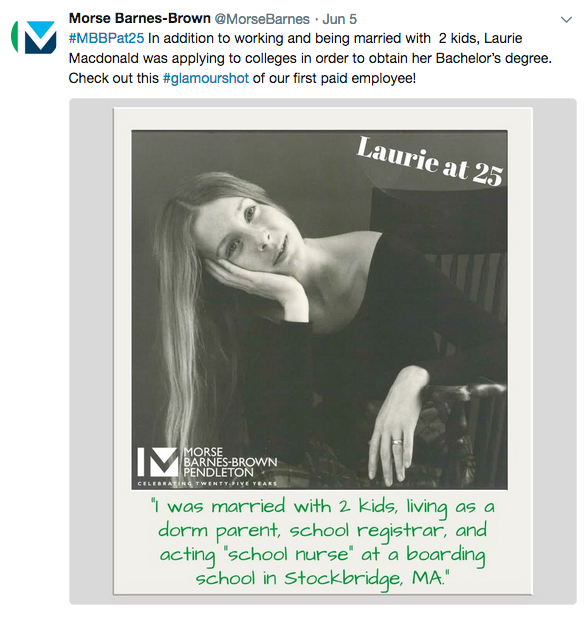 Read more about the firm’s beginning and growth here: MBBP Celebrates 25th Anniversary. 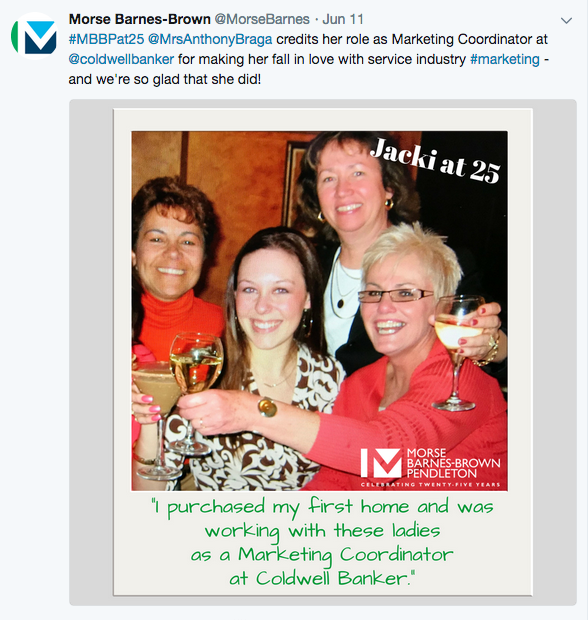 Certainly the success of any social media campaign is to attract the attention of/engage clients, potential clients and stakeholders — and this one does that. But it also does a wonderful job of storytelling and connecting, and reminding us both about our own selves and how little we may know about each other. Hats off to MBBP on this creative, humanizing and joyful celebration. Follow them at @morsebarnes to see more….